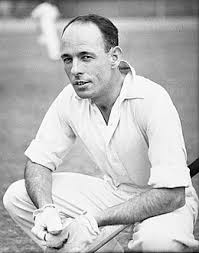 Jack Fingleton was a top order batsman, good enough in his time to score 1,189 Test runs at 42.46. His reputation falls some way short of the top Australian batsmen of his era, the 1930s, and of course he was in no way comparable to the mighty Bradman. But his record isn’t too far inferior to the likes of Bill Woodfull, Bill Ponsford or Stan McCabe, and certainly better than those of Alan Kippax or Victor Richardson. In the 21st century Fingleton is remembered primarily for two things, first the legacy of fine cricket writing that he has left us with, and secondly his antipathy towards Bradman, a man whom he had little regard for as a human being, although he never disputed his talent with the bat. Indeed Fingleton supported Bradman in some formidable partnerships for Australia and, until the Don transferred his allegiance to South Australia, for New South Wales as well. From Irish Catholic stock Fingleton was born in Sydney in 1908. He was the third of six children and life was not easy. Fingleton senior was a tram driver and, for a short time, a member of the New South Wales parliament. He died of tuberculosis in 1920, which necessitated the 12 year old Fingleton leaving school to enable him to contribute to the struggling family’s finances. He did a variety of menial jobs before, at 15, becoming a copy boy with a newspaper. Fingleton started to read voraciously, and the job with the paper was the start of his career in journalism. As a reporter Fingleton would, as a youngster, report on anything and everything that got him work. In time he concentrated on sport, more particularly cricket, and politics. He chose to live in Canberra in order to have ready access to those in government. Overseas trips were frequent as Fingleton went on tours to report the cricket, but he never left politics entirely alone, one of his favourite venues in England being the House of Commons. In time in addition to the writing Fingleton became as accomplished broadcaster as well. Outside his newspaper work Fingleton’s passion was cricket, and he played first grade for Waverley. The club’s wicket was not a good one, and batting on it was always a challenge but, with courage, a sound technique and good concentration Fingleton, as in his journalistic career, made steady if unspectacular progress. Fingleton made his First Class debut at the age of 20, batting at number eight in a powerful New South Wales batting order. He began with an unbeaten 25, from an unbroken partnership of 111 with Bradman, who was on 340 when the declaration came. It is worth remembering that Bradman was no seasoned veteran at this stage, and was actually four months younger than Fingleton. Initial progress was slow, but in 1931/32 Fingleton got himself noticed by scoring a century against the touring South Africans. He sat through the second, third and fourth Tests as twelfth man, watching Bradman make hay and his teammates taking a 4-0 lead. He would have been twelfth man again for the final Test, but Bradman and Ponsford picked up injuries, so he got his chance as Woodfull’s opening partner. The match was played at the MCG. South Africa won the toss and decided to bat on a rain affected wicket. They were all out for 36, and Woodfull was bowled by the first delivery of Australia’s reply. It looked like Fingleton had chosen the worst possible moment to make his debut, and Australia in turn were all out for 153. Alan Kippax top scored with 42, but Fingleton got 40 in a typically brave and obstinate innings. He didn’t get the chance to bat again as South Africa’s second innings was little better than their first, all out for 45. And then it was Bodyline. Fingleton played in the first three Tests of that famous series. In the first Test he scored 26 and 40, battered and bruised and prompting praise for his courage from both Harold Larwood and Douglas Jardine. Australia lost by ten wickets however. The second Test was the one of the five that Australia won. Bradman’s second innings century is what was celebrated, but without Fingleton’s 83 in the first innings England would probably have won that one as well. In the infamous ‘Battle of Adelaide’ Fingleton got a pair, so that would not have helped him, but there was another factor at work, one that to an extent dogged the rest of Fingleton’s life. As a professional journalist Fingleton was not required, subject to some controls on his cricket writing,to accept the Board’s ban on players writing for the press. Bradman, who had signed lucrative contracts with a newspaper and a radio station wanted a similar dispensation. It was not granted. It was at Adelaide that Woodfull was struck over the heart by a Larwood delivery, and later Bert Oldfield was badly hurt. There was then a famous exchange when the England manager, ‘Plum’ Warner sought out Woodfull to apologise which culminated in the Australian captain saying; one side is playing cricket and the other is not. This sort of thing is ruining the game, which is too good to be spoiled, and it is time some men got out of it. The exchange found its way into the press, but who told them? The assumption was it was Fingleton. He always denied that, and believed Bradman was responsible. In Fingleton’s eyes, and although Woodfull denied it at the time many years later he told Fingleton it had been the case, the belief that Fingleton had been responsible for that leak was the reason he missed out on selection for England in 1934. His Test career was therefore on hold until the trip to South Africa in 1935/36 when, with Ponsford and Woodfull retired and Bradman unavailable he was an obvious choice. He averaged almost 80 for the series, and scored centuries in the third, fourth and fifth Tests, all innings victories. A year later Gubby Allen’s England side visited Australia, and Fingleton made it four out of four with exactly 100 in the first Test. In the third Test of a strange summer Bradman, by now Australian captain, reversed his batting order in an attempt to spare his batsmen the worst of a sticky wicket. As a result he and Fingleton came together at 97-5 and then added 346. Fingleton scored 136, his last and highest Test century. After a good summer in 1937/38, over which Fingleton was behind only Bradman, Lindsay Hassett and Jack Badcock in the season’s averages, his selection to tour England in 1938 was a deserved one. With the bat Fingleton had a disappointing time in England however, scoring just 123 runs in six Test innings with a highest score of 40. The third Test was abandoned without a ball bowled and in the last Test, when Len Hutton famously scored 364 out of a total of 903 Fingleton, like Bradman, was unable to bat in either innings, in Fingleton’s case courtesy of a pulled muscle. Had the pair managed to get to the crease fully fit then they might not have changed the result, but England certainly wouldn’t have won by anything like an innings and 579 runs. Although his batting may have been a little disappointing Fingleton did at least meet his future wife on the boat from Australia to England. Some eleven years his junior Philippa Street was a strikingly attractive girl who was travelling with her mother to England. The spirit of the Suffragette movement was strong in Fingleton’s future mother in law who had married into a prominent New South Wales family. She was active in politics all her life, particularly in relation to women’s rights and social justice. Given his lifetime intolerance of ‘queers and commies’ it is in some ways surprising that Fingleton seems to have been accepted by his bride’s family, who were even prepared to agree to his demand that Philippa convert to Catholicism. The marriage was blessed with five children, but the age difference and Fingleton’s frequent absences took their toll and, in addition, Philippa was never particularly happy living in Canberra. The couple were to separate in 1967 when Philippa returned to Sydney to be with her family. Fingleton always hoped that there might one day be a reconciliation, although in that he was to be disappointed. That said despite the physical separation the family unit remained intact, and there was never a divorce. Anyone reading very much about Fingleton will see him described as a man of firm convictions, and he was never afraid to make his views known, taking no prisoners in doing so. The veteran West Country cricket writer David Foot, who as a young reporter occasionally shared a press box with Fingleton, talked of weighty shoulder chips, and a defensive swagger. Such traits are not unusual in those from humble backgrounds, and were no doubt encouraged too by prejudice. It was not until researching this feature that I realised just how bad sectarianism was in Sydney in Fingleton’s youth, many job advertisements openly stating that Catholics need not apply. The Bradman problem was no doubt touched by the same considerations. Bradman was a protestant, and his ancestry English. ‘The Don’ had great respect for the ‘mother country’ and was a loyal supporter of the monarchy. In his post playing days he also showed himself to be a traditionalist and it is easy to just see why he alienated so many of his teammates – as ‘Tiger’ O’Reilly once quipped the Bradman Appreciation Society could meet in a telephone kiosk. There were however many other than Bradman with whom Fingleton did not get on. Perhaps surprisingly the great egalitarian John Arlott was one, Fingleton being known to declare in public that Arlott refused to work with him. That was a little strong, as they certainly did work together on occasion, but it is clear that Arlott was no admirer. One factor in that one seems to be the lack of any significant ability as a player on Arlott’s part. Fingleton also had a difficult relationship with well known Australian writer/broadcaster, Alan McGilvray. Like Arlott ‘McGillers’ was no Test player, but he had opened the bowling at Shield level. The expectation would consequently have been that the relationship with Arlott’s great ‘rival’, the snobbish EW ‘Jim’ Swanton would have been even worse. In truth however it seems it wasn’t. After Fingleton’s death Swanton was effusive in his praise, although he did add that if he was not exactly an easy professional companion, he was certainly a stimulating one. What is certain is that there are no reports of the pair ever falling out, but it is notable that Fingleton was recognised by many as often enjoying the company of ‘toffs’, which certainly was what Swanton aspired to be. In addition whilst Swanton’s First Class career amounted to no more than three matches for Middlesex against the Universities, by dint of his selection alone he was clearly a cricketer of rather more ability than Arlott. A man of firm beliefs Fingleton could always be controversial, and doubtless caused some of his editors a few sleepless nights, and kept the libel checkers busy. He offended half of Yorkshire (whilst doubtless delighting the other half) by declaring, after acknowledging his technical ability, Geoffrey Boycott to be the most selfish cricketer I have ever known. It is a remark worth noting in a different context in the sense that if that accolade fell to Boycott, then it cannot have been Fingleton’s view of Bradman. Sometimes those on the right side of Fingleton could suddenly find themselves ostracised. One such was writer David Frith who had, as a 21 year old, been delighted to get to know Fingleton during the 1968 Ashes series in England. Five years of friendship later however and Fingleton took great exception, despite apologies and explanations, to Frith’s use of the word ‘mischievous’ in an article about Larwood’s emigration to Australia. Frith next encountered Fingleton in 1977 whilst playing for an Australian press eleven against their English counterparts in a match umpired by Fingleton. There is an account of the game in Frith’s autobiography, but he knew of no real explanation for why Fingleton seemed to have decided that, from that day forth, the pair were friends again. The Larwood migration story and Fingleton’s role in it is one that provides another interesting insight into the Fingleton personality and amply demonstrate that, generally, he was not a man to bear a grudge. Unsurprisingly Fingleton disapproved strongly of Bodyline and was, as we have seen, very much on the wrong end of it on a personal level yet the relationship between Fingleton and Larwood was always a good one. When Fingleton looked up his old adversary in England in 1948 (the pair had had no contact since 1932/33) Fingleton became a source of encouragement to Larwood, his wife and five daughters, to seek to make a new life for themselves in Australia. They quickly moved a long way from the initial meeting where Fingleton, chaperoned by former Lancashire and England wicketkeeper George Duckworth, had to spend some time reassuring Larwood, so often a victim of unscrupulous pressmen, that he was not just after a story. The friendship rekindled Fingleton was then a source of much practical assistance in making the actual arrangements, including enlisting the assistance, practical and financial, of the former Australian Prime Minister Ben Chifley. Larwood might well have been reassured as to Fingleton’s integrity by his criticism in 1948 of the short pitched bowling of Ray Lindwall and Keith Miller something for which Fingleton, naturally, blamed their captain Bradman. It was a view that never changed, and when Clive Lloyd’s four pronged pace attack was introduced in the mid 1970s Fingleton was just as critical of that. Moving on to his writing the first cricket book to emerge from the pen of Fingleton was Cricket Crisis, published in 1946. More than half the book is taken up with reflections on the 1932/33 tour. There had been an outpouring of books at the time, and the flow has continued unabated ever since so much so that any truly comprehensive library on that famous tour would now have to house the best part of thirty books. Add in biographies and autobiographies of the protagonists and that figure could certainly be doubled. All of the books hold some interest, but only a handful merit the description ‘indispensable’, and the first of those was Cricket Crisis. The second book from Fingleton was Brightly Fades The Don, an acclaimed account of the 1948 tour. The book displays no warmth of feeling for Bradman, but is appropriately respectful of his reputation and certainly, as Fingleton always did, recognises the pre-eminence of his batting. The account of that famous duck in Bradman’s final Test innings is also an interesting one. It gives no hint at all of what was, apparently, actually going on in the press box, that being Fingleton and O’Reilly both convulsed with laughter and celebrating the second ball dismissal for nought. Fortunately for Ashes enthusiasts there are also accounts by Fingleton of the 1950/51 and 1953 series entitled, respectively, Brown and Company and The Ashes Crown the Year. For whatever reason no publisher was prepared to commission him to write on the next two series in 1954/55 and 1956, which is a great shame. His thoughts on the Old Trafford Test in 1956 when Jim Laker took his 19-90, and England’s successful recalls of Cyril Washbrook, Denis Compton and David Sheppard would have been interesting. After the hiatus a Fingleton book was back on the release schedule for the controversial 1958/59 series, its title telling the reader all he or she needed to know about Fingleton’s views; Four Chukkas to Australia. The last of Fingleton’s tour accounts was The Greatest Test of All, although the narrative was concerned with just one match, the tied first Test of the 1960/61 series between Australia and West Indies. In 1958 a book of pen portraits appeared from Fingleton. Masters of Cricket – From Trumper to May. There is no chapter on Bradman, but at least the explanation for why not is logical if not entirely convincing, that being that he had already written a great deal about Bradman in Brightly Fades the Don. Exactly ten years later, in 1968, Fingleton wrote a feature on Bradman for the magazine World Sport, which subsequently appears in the 1972 anthology Fingleton on Cricket. It is an interesting piece not least because Fingleton wrote to Bradman asking for his input on certain questions he intended to cover, and received a full reply. The tenor of the essay suggested, perhaps, some sort of rapprochement. That suggestion was put firmly in its place by Fingleton’s next book, published in 1978,The Immortal Victor Trumper. Fingleton was the first to attempt a biography of Trumper, and certainly had the best title, but neither he nor the two men who have subsequently attempted the task, Ashley Mallett and Peter Sharpham, produced an entirely happy book. The problem with Trumper is that there are significant gaps in his story that no researcher has been able to fill, and in Fingleton’s case there is also an inability to avoid the comparison with Bradman, and he ensures, not altogether convincingly, that Trumper comes out of that one ahead. It was in this book that for the first time Fingleton came out and accused Bradman publicly of being the 1934 ‘leaker’, with the unfortunate and unintended (albeit surely entirely predictable) side effect that for many that became the story of the book, rather than Trumper’s tragic genius. By this time Fingleton’s health was less than perfect and he stopped travelling to watch games, preferring to remain at home working from his office. His work was never less than interesting and often demonstrated his dislike and distrust of all things to do with limited overs cricket and, the dominant issue of the day, Kerry Packer’s World Series Cricket. As usual Fingleton did not mince his words and, with Packer being equally happy to speak his mind, when the two met there were some who feared fireworks. In the event it seems the two men got on pretty well and had a convivial discussion, but neither even began to change the views of the other. What turned out to be Fingleton’s last project was his autobiography a book which, despite his publisher’s preferences, he was eventually able to call Batting From Memory. Three of the book’s nineteen chapters were devoted to Bradman. They were clearly the part of the book that gave Fingleton most concern, but contained little that was new. The old complaints are drawn together and explained once more. As ever Fingleton gives full credit to the genius Bradman demonstrated with a bat in his hand, and indeed there are a few other areas where Fingleton is magnanimous towards his old foe, but not many. A launch party for Batting From Memory was scheduled for the end of November of 1981. In fact however it became a memorial for Fingleton, who suffered a heart attack shortly after arriving at his daughter’s home in Sydney where he was staying for the purposes of the event. On his way to the hospital he is said to have asked the ambulance driver, his sense of humour clearly undamaged, am I going to cark it? Sadly two days later he did. He was 73. Whatever his flaws Jack Fingleton clearly possessed many qualities, summed up very well by those who knew him best. Of his cricket Larwood wrote; he was a tough little bugger, you couldn’t knock him down. As far as the writer/broadcaster in him is concerned Swanton described him as the best his country has produced. Of Fingleton the man I particularly like the words of Michael Parkinson, a man whose writings on any subject are always well worth reading. Everything I have read about Fingleton seems to be captured in Parkinson’s observation that he was a funny, cantankerous, wise and argumentative man.